It's been busy, at home, at work, in my head, things have been going along at a fast pace and I am scrambling to keep up with it all. The best bit about this week though has been the rain, up until this morning we had had 59mm, that my friends is glorious rain for us, the last decent rainfall we had was in July last year, so this was very welcome, as things were getting dry and everyone's confidence was getting low. So this week I am grateful for the lovely rain we've had, for the fact that even though I'm in a bad mood, the rain kind of matches my mood and it's made Muddy Hubby very happy, so that is a good thing. I'm also grateful for the lovely Bush Mobile that comes once a fortnight, it lets my kids get dirty and messy and have lots of fun and my only thing to clean up is their clothes. It's a win win for us. I am grateful for the afternoon routine of feeding the animals, to stroll outside and spend some time feeding the animals, getting to know them and watching the kids joy as they feed them and care for them. Lastly this week I am grateful for shovels at the back door, so that we are always prepared when the snakes are about. We got another one at the back gate this week, it was dark and my wonderful sacrificial snake dog alerted us to it, and Muddy Hubby was quick to act, stopping the snake from getting our precious dog, so yes, I am grateful for shovels and for my snake sticks which are now charged and working in the garden. 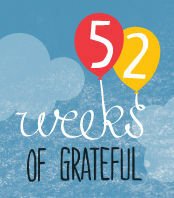 Linking up for 52 Weeks of Grateful over at Village Voices. Bron hosts a great link up every week, definitely worth checking out! Whats your opinion on the snake sticks so far? Do you think they work? Oh Nat,you're wonderful how you take snakes in your stride! I'm so glad that you've got rain finally, we're just about floating here, and I'm sick of the damp. I hope this week sees more of the wet stuff for you. I always adore reading about your wonderful lifestyle, Nat. I wish that Bush Mobile came to the city!! I hope those snake sticks are working for you. Do let us know as I fancy a few of those at my place if you think they are good.